I'm still trying to remember the last time I've laughed so hard- Trust me, I'm struggling. 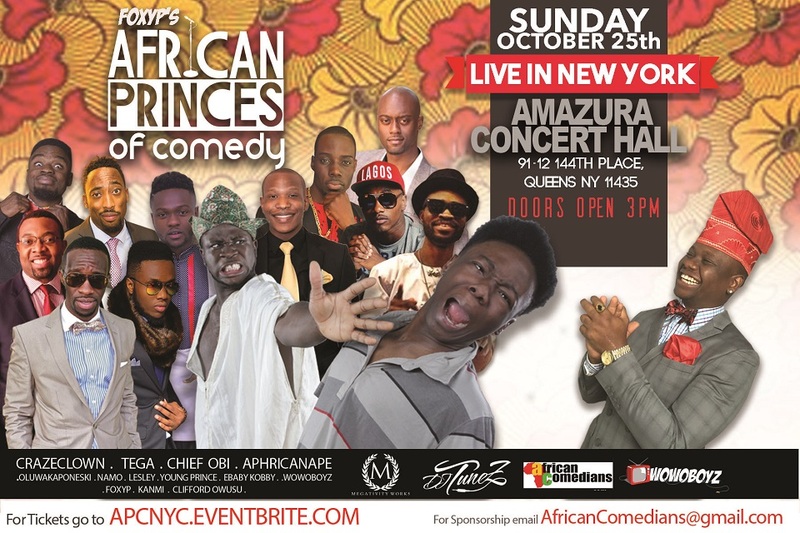 This weekend, Foxy P packed up the infamous Amazura Hall with the best line up in the history of African comedy. Talents from all corners of the world came out and did what they did best: Make us laugh. Hosted by the talented and very handsome Young Prince aka Segun Williams, The African Princes of Comedy event was the place to be. If you didn't relive a few childhood memories or couldnt relate to the colorful language used to describe the very things we go through as africans today...My friend, you were at the wrong show!! As if the stand ups didn't leave us unable to sit still (Namo, Lesley, Kanmi & more), DJ Tunez just couldn't keep us in our seats. Did I mention the choreography that Clifford Owusu and the k5 gang put on? The biggest treat of all was the live skit featuring some of our favorite characters (Mama Tobi, Martha, AphricanApe, Chief Obi, Crazeclown, Tegaa & More), not to mention the guest appearance of one of my favorite comedians all the way from London, Mr.Dont Jealous Me himself! The Nygerian community is ever growing, and with every generation, we seem to add a new dimension of art, culture, and diversity. Our goal is to highlight this unique community and capture it to the best of our ability. The purpose of this blog is to define the unique culture of being a Diaspora in New York. The Nygerian and overall West African diaspora community is ever growing, and with every generation, we seem to add a new dimension of art, culture, and diversity. Our goal is to highlight this unique community and capture it to the best of our ability. Are you a West African living in New York with a unique point of view? We are looking for bloggers who can write original, high quality blog posts. The Nygerian Team is fun, innovative and always looking for fresh new ideas.